Today’s typical golfer faces many challenges. Not only are golf courses becoming longer and more difficult, but today’s golfer is actually less prepared to play the game. In today’s automated society of long commutes, computers and television, many golf enthusiasts are not properly conditionedbecause of a lack of movement in their everyday lives. People today are spending more time in office-related jobs and more hours at work. Due to this, individuals are sitting for longer periods of time (less daily activity), increasing the chances of poor posture, muscle imbalances, and poor cardiovascular conditioning. The combination of a dynamic movement like a 100 mph golf swing and a 3-4 mile walk can be very challenging for most people and lead to poor performance and/or injury. Golf is considered to be a moderate risk activity for sports injury (1). 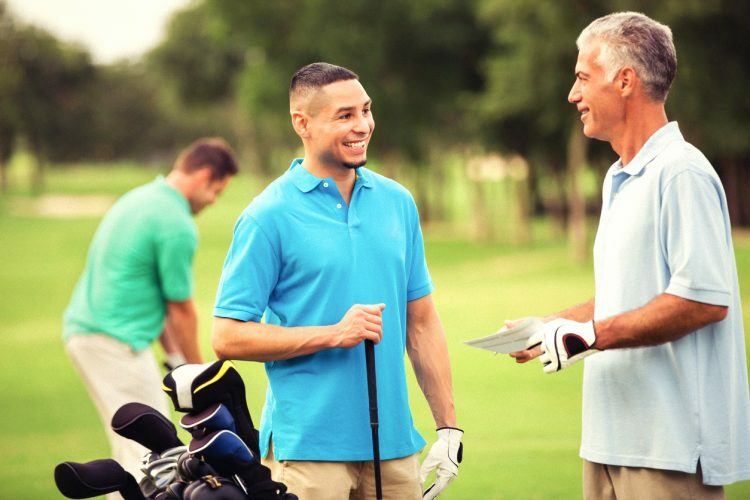 Golf injuries originate either from overuse or from a traumatic event and primarily affect the elbow, wrist, shoulder and low-back. Many of these injuries can be prevented by a short, practical, pre-game warm-up routine before each round. But the earlier you get started with an exercise program the better. During an 18-hole round of golf the average male golfer will expend approximately 620 kcals of energy (2). This constitutes a moderate exertion physical activity and requires that golfers have at least moderate levels of aerobic conditioning, as well as muscular strength, and endurance. During the golf swing, the head of the golf club travels approximately 27 ft and over 100 mph in roughly two seconds (3). Due to the ballistic nature of the golf swing certain segments need optimal flexibility (calves, hips, back, chest, thoracic spine) while others require strength (glutes, abdominals, rotator cuff, low-middle back) for optimal joint motion and injury prevention. Start walking!! This will help build a stronger cardiorespiratory system. A strong cardiorespiratory system can help prevent unwanted movement caused by fatigue. Start an exercise regimen!! Your workouts should consist of flexibility, strengthening, and cardiorespiratory exercises. Start as early as you can. A well-conditioned golfer is less likely to fatigue on the back nine. Warm-up 30 minutes to 1 hour before every tournament for injury prevention. During the tournament remember to drink plenty of water, and wear sunscreen. Cabri J, Sousa JP, Kots M, Barreiros J. Golf-related injuries: A systematic review. European Journal of Sport Science. November 2009; 9(6): 353-66. Dear JB, Porter MM, Ready AE. Energy Expenditure during Golfing and Lawn Mowing in Older Adult Men. J Aging Phys Act, 2010: 185-200. Patria A. Hume, Justin Keogh, Duncan Reid. The Role of Biomechanics in Maximizing Distance and Accuracy of Golf Shots. Sports Med 2005: (5) 429-449.